Electric vehicles may not go as far in the snow, AAA reported. DETROIT — Electric vehicle owners should be acutely aware that their cars might not get nearly the same range in the winter months, according to a new study released by AAA. The study found that cold temperature can sap electric car batteries, temporarily reducing their range by more than 40 percent when heaters are used on the inside of the car. 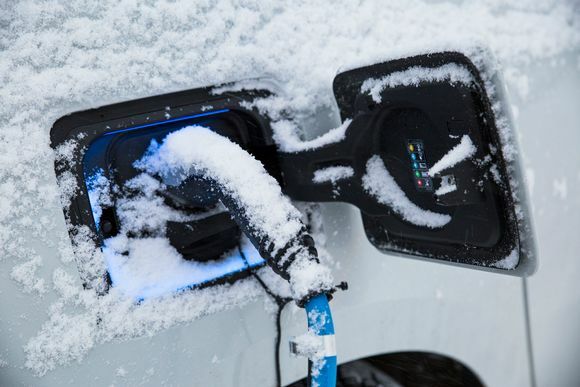 “As long as drivers understand that there are limitations when operating electric vehicles in more-extreme climates, they are less likely to be caught off guard by an unexpected drop in driving range,” Greg Brannon, AAA’s director of automotive engineering, said in a statement. During this past month’s polar vortex, many electric vehicle owners, including Tesla owners, complained about the lack of range and frozen door handles on their vehicles, AAA said. The models tested were BMW i3s, Chevy Bolts, the Nissan Leaf, the 2017 Tesla Model S 75D and Volkswagen e-Golf, which all get at least 100 miles per charge. These vehicles were tested on a dynamometer, a treadmill-like device, in a climate-controlled cell. At 20 degrees, the average driving range fell by 12 percent, and the range fell by 41 percent when the heater was turned on, AAA said. Tesla disputed the results in a statement, but did not release a percentage relating to its cold weather range. According to AAA, drivers should heat or cool their cars while still plugged into a charging station. Extra planning can maximize battery life, especially during cold temperatures when running out of power is stronger possibility. A report from Green Car Reports disputed the AAA report, however, saying that AAA’s own 2016 data showed that electric vehicle owners did not get stranded often, regardless of the time of year. “Yes, you’ll have to plug in more often in the winter,” the report said.